Wide and luxurious – a soft, delicate pattern to soothe the skin. Recreating summer rain, the spray provides full and even coverage. 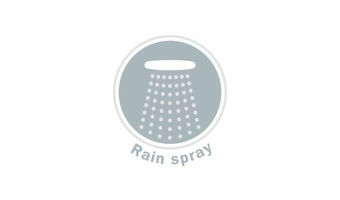 Wide, soothing and luxurious, GROHE Rain Spray provides a full and even pattern that is as calming as warm summer rain. Soft and delicate, the coverage is guaranteed to wash away stress leaving you refreshed and totally relaxed.